People visit the Old Tower Records building in the Castro to look over the largest collection of portions of the AIDS quilt spread over the Castro District. 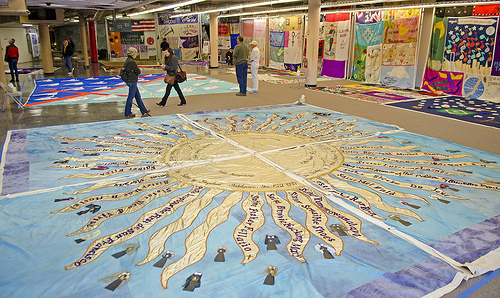 The quilts will be displayed through February 20, 2012. Photo by Gil Riego Jr. I had taken the J train on the MUNI to the Castro so my walk home was longer. It did not matter, I had to work on President’s Day and just finished my last meetings with clients. The walk was welcomed. I strolled up Market until I came in front of the AIDS Memorial Quilt display that is on tour in the Castro. I decided to walk in and see it . I know friends who have helped organized this historical display and who were also participating in the reading of names. First, I was surprised by the immediate wave of emotion that filled me as I saw the number of quilts on display. This was only a fraction of them, also. Each represented a life taken down by this killer disease. Many died before there were medical protocols to help prolong life and handle symptoms as exist now. Many died during a time where there was even a greater stigma that the disease was a gay plague brought on by the Divine as a consequence of homosexuality. Many things have changed since those times and some things are still being worked on, but the aftermath is that many millions have lost their lives because of it. I read names of people, mostly men, of my generation. 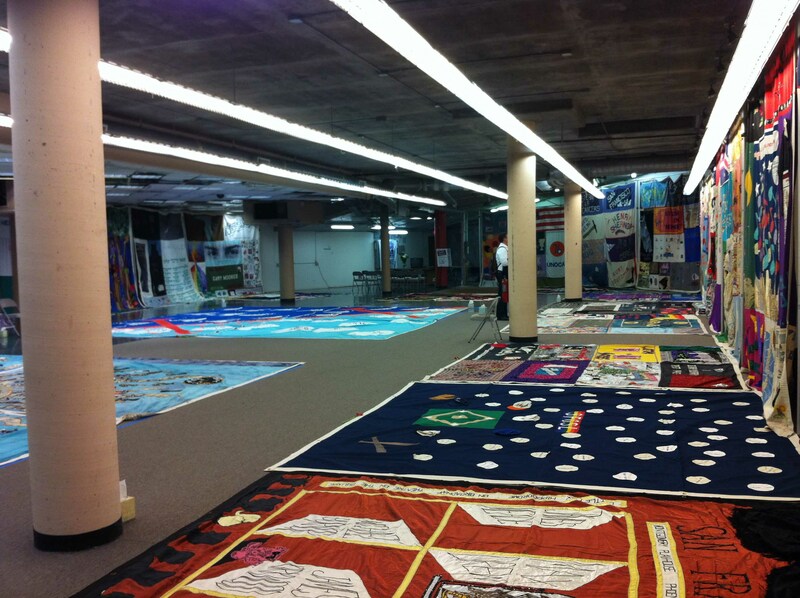 Each quilt worked hard to represent the person who had passed on and I was having one of those sacred moments that I could feel them there with me. My heart wept. What a loss of life. I thought of all the goodness and contributions these individuals would have given and would have continued to give today. Whole generations of some of the brightest in our community are no longer here. Imagine our world if they all had lived. There are so few of that generation around now, so to stand alone, among my departed brothers in this memorial to them, riveted my soul. I could hear the names being read by the reader at the podium. I was really fighting my own tears and soon I could not stand it anymore but walked out the door. The sadness was great in my heart but I was so glad that this quilt memorial exists. Many, whose names and images were displayed, would have been forgotten by a society that judges far too harshly and marginalizes differences. I walked towards home asking the heavens for me to never forget and to always care.